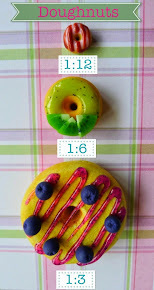 Littlest Sweet Shop: Macaron fridge magnets - instant boring fridge makeover! 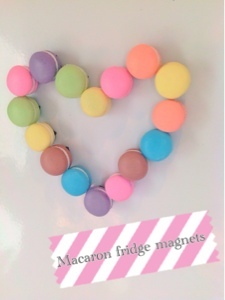 Macaron fridge magnets - instant boring fridge makeover! Recently I sold some macaron fridge magnets to a French buyer (hope she likes it!). Food models look good on a fridge since you can display your cute miniatures and decorate your fridge all at the same time! I would recommend 1:3 scale macarons if you are planning to decorate your fridge with it. Warning: The pastel candy colours can make you feel peckish. 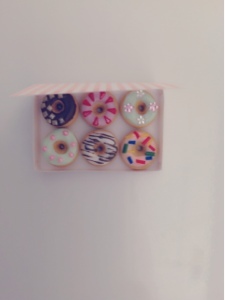 Any other food models with a flat base (cake, cookies, donuts, pie, box of donuts, box of chocolates) can be turned into fridge magnets. Just ask and I will add the magnet to your order for free!